Well now, just when you think that things in this country couldn’t get anymore twisted or disgusting…it does just that and gets even more twisted and disgusting. 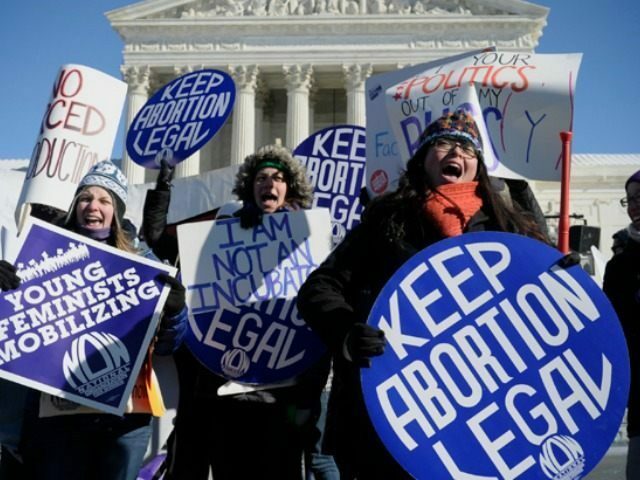 The left has now passed a bill in Oregon that would now provide free abortions for all females in the state and that includes illegal immigrants as well. Now we are providing murder rights to illegals as well. Following the state House’s approval of this bill, the liberal leaders took no time in condemning President Donald Trump’s pro-life agenda, just as you would expect demon spawn to do. House Bill 3391, the Reproductive Health Equity Act, ensures that all Oregonians receive the full range of preventative reproductive health services they need at zero out-of-pocket cost – regardless of their income, citizenship status, gender identity, or type of insurance. The bill passed, 33-23, with no Republican votes and one Democrat joining Republicans, and now heads to the state Senate. Republican-led legislatures in other states have been cutting reproductive care through draconian budget cuts and legislation making it harder for women to access critical services. Republican politicians in Washington D.C. are attempting to repeal the Affordable Care Act, which would cause Oregonians to lose no-cost preventative reproductive health care and essential benefits. With HB 3391, Oregon will be moving boldly in the opposite direction, protecting and expanding access. Americans suffering from overpriced health care. “For people living paycheck to paycheck, denying coverage for abortion or birth control can jeopardize a family’s financial security and push them deeper into poverty,” the state House Majority Leader stated. “When everyone in our community has access to health care—including contraception, reproductive health services like STD diagnosis and treatment, pre- and post-partum care, and abortion—it improves the health of individuals, families, and entire communities,” stated Rep. Jeff Barker arrogantly during the press release. Again…the logic of asshats. This bill is going to be a $10 million measure that focuses on reproductive rights and it would also require that all insurance companies there in Oregon make it a mandatory thing to cover these abortions for ANY reason. Regardless of income, insurance plan, citizenship status, sexual orientation or gender identity. How is something like this so easily created in a country that is now quite divided on these very issues? Nothing makes sense anymore. The bill earmarks some $500,000 for the Oregon Health Plan – the state’s Medicaid plan – for the approximately 22,873 illegal women immigrants, the Washington Times reports. [P]rohibits interference by public body in consenting individual’s choice to terminate pregnancy. Prohibits public body’s interference with health care provider terminating or assisting in termination of pregnancy of health care provider’s patient, if health care provider is acting within scope of provider’s license. Republicans attempted to block the measure with a failed motion to return it to committee. Democrats have the majority in both the state House and Senate and Gov. Kate Brown is also a Democrat. Republican state Rep. Jodi Hack described the vote Saturday as “the saddest day I have experienced in the Oregon Legislature,” according to the Times. I happen to agree with her. We already have shown that protecting ‘human life’ is not of the utmost importance to us through the abortion laws that continue to stand in place, now we are spreading that idea and making it okay for illegal immigrants as well? They can come, they can make bad decisions, then erase the innocent life that comes as a result? It is heartbreaking, and it is wrong. None of this makes any sense at all. Abortions aren’t healthcare, they are murder. This is what happens when you vote idiots into office. Consequences of such decisions follow, and in this case the consequences are deadly.